My mom recently lent me some binders filled with genealogical information. In them, I was excited to find my great-grandmother’s obituary. She was the wife of Leo Bohnsack and my mom’s grandmother. Minnie (Deininger) Bohnsack died before I was born, but my mom has always spoken very warmly of her. Mom said Minnie was the sweetest lady, made the best bread, and spoke with a heavy German accent. I find the fact that Minnie had an accent interesting since she was born in Galena, Illinois. Her parents were German, and Mom remembers that as a child everyone spoke German and she didn’t know what they were saying. I don’t know which newspaper the obit was published in. The paper is extremely yellowed, almost orange, so I did my best to lighten it up. Also, the text was blurry, so I sharpened it as best I could. Mrs. Minnie Bohnsack, age 71, of South Dodge St., Galena, passed away Wednesday, August 13, at the Galena Hospital after an extended illness. 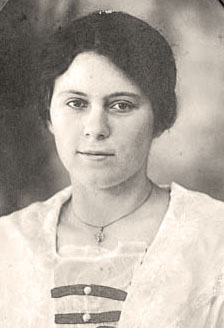 Born in East Galena Township on February 10, 1898, she was a daughter of the late William and Louise Mugge Deininger. In February, 1916 she was united in marriage to Leo Bohnsack in Galena. They farmed in the Schapville area for 25 years, until 1941, when they moved to Galena and Mr. Bohnsack went to work at the Savanna Ordinace Depot. He preceded her in death July 28, 1957. 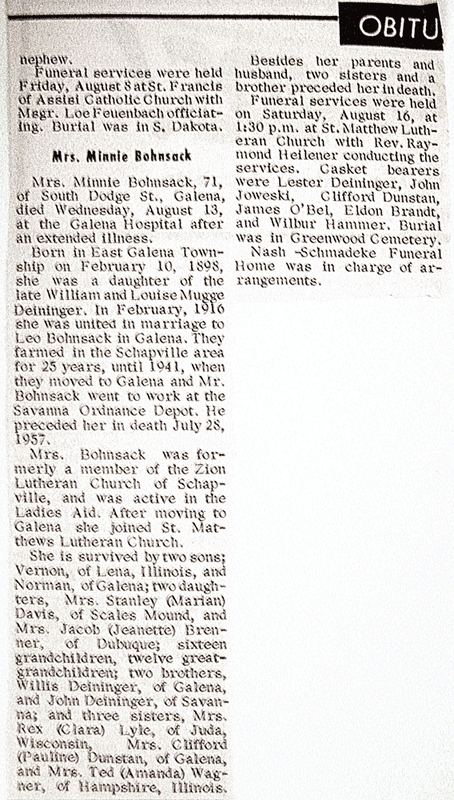 Mrs. Bohnsack was formerly a member of the Zion Lutheran Church of Schapville, and was active in the Ladies Aid. After moving to Galena she joined St. Matthew Lutheran Church. She is survived by two sons: Vernon, of Lena, Illinois, and Norman, of Galena; two daughters, Mrs. Stanley (Marian) Davis, of Scales Mound, and Mrs. Jacob (Jeanette) Brenner, of Dubuque; sixteen grandchildren; twelve great grandchildren; two brothers, Willis Deininger, of Galena, and John Deininger, of Savanna; and three sisters, Mrs. Rex (Clara) Lyle, of Juda, Wisconsin, Mrs. Clifford (Pauline) Dunstan, of Galena, and Mrs. Ted (Amanda) Wagner, of Hampshire, Illinois. Besides her parents and husband, two sisters, Mrs. John (Rose) Joweski, and Mrs William (Bertha) Studier; and a brother, Herbert, preceded her in death. Funeral services were held on Saturday, August 16, at 1:30 P.M. at St. Matthew Lutheran Church with Rev. Raymond Heilener conducting the services. Casket bearers were Lester Deininger, John Joweski, Clifford Dunstan, James O’Bel, Eldon Brandt, and Wilbur Hammer. Burial was in Greenwood Cemetery. Nash-Schmadeke Funeral Home was in charge of arrangements. Discovery: Picture of Lawrence Bausman Family?